No Piggies In These Blankets! I take both my football watching and my party food seriously. The Super Bowl is an event on both fronts. Today’s game was a particularly sweet one for me because, even though my team was not invited to the big dance, I am from Pittsburgh: it is my birth right to hate the Patriots. My apologies to all of you New Englanders out there – it’s nothing personal against you. I just really, really dislike your team. No hard feelings. To make sure that we all stay friends, I offer you this recipe as a peace offering – it’s a fitting peace offering because I guarantee that if you bring it to your next sports watching function it will bring carnivores, vegetarians, and vegans together over one plate of delicious food: No Piggies in Blankets … or … Veggie Dogs in Sleeping Bags … or … Happy Piggies Don’t Sleep in Blankets (unexpected bonus of bringing these to a party: people have a really fun time trying to come up with names for them). 2. Sprinkle the flour over the soymilk, making sure that the soymilk is completely covered. Add the salt, sugar, and butter to three separate corners of the bread pan. Maker a shallow indentation in the center of the flour, making sure not to go down as far as the liquid, and add the yeast. 3. Set the bread machine to the dough setting and press start. 4. When the dough cycle has finished, remove the dough from the pan and punch it down gently. Take a little more than half of the dough, roll it out on a lightly floured surface and, using a pizza cutter, slice the dough into small squares about 2” x 2”. Wrap the rest of the dough in plastic and put in your refrigerator for use in another meal in the next few days or place in the freezer for use sometime in the next few months. 5. Cut the vegan dogs into thirds. 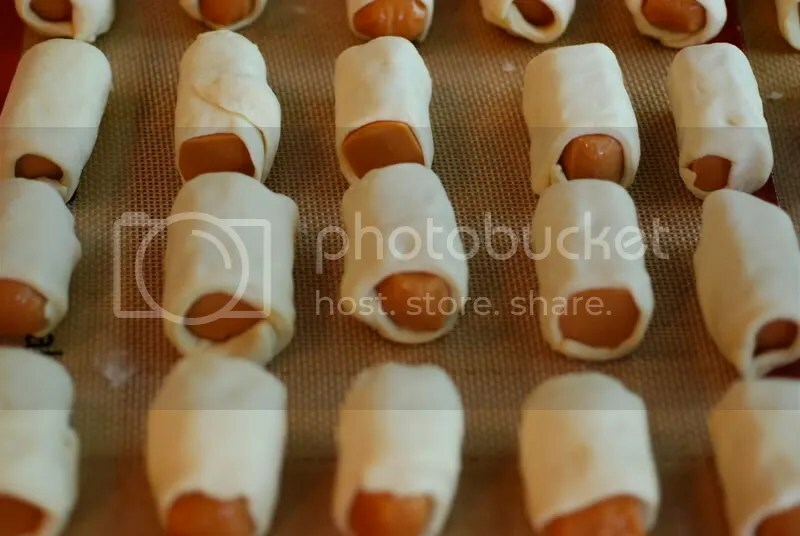 Wrap each veggie dog section in a piece of the dough, taking care to press the seam together, and set the dough wrapped dogs seam side down on a baking sheet that has a silplat sheet (a non-stick silicone sheet) on it or has been lightly greased. 6. Cover the dough wrapped dogs with plastic wrap and let rise for 30 minutes. Meanwhile, preheat the oven to 400F. 7. 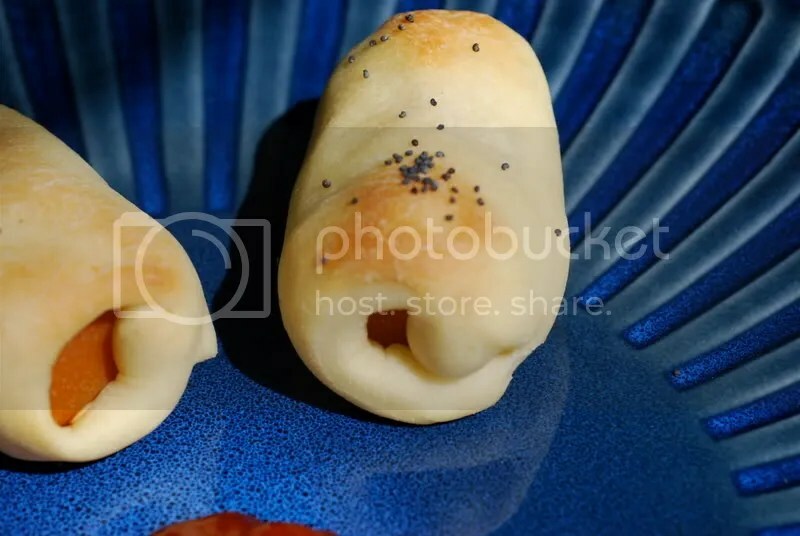 Lightly brush the dough wrapped dogs with olive oil and sprinkle with sesame seeds and/or poppy seeds. 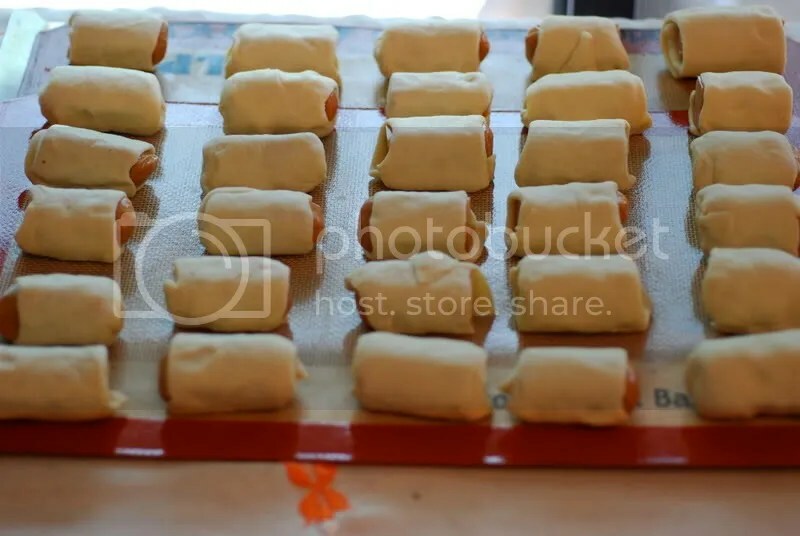 Bake the veggie dogs for 12-15 minutes, until golden brown. Cool slightly on a rack. These can be enjoyed warm or at room temperature. Gail, who knew you were such a big football fan? (Well I guess people who actually know you…. 😉 ) Are you going to the Pro Bowl again this year? And how about that catch? Wow! 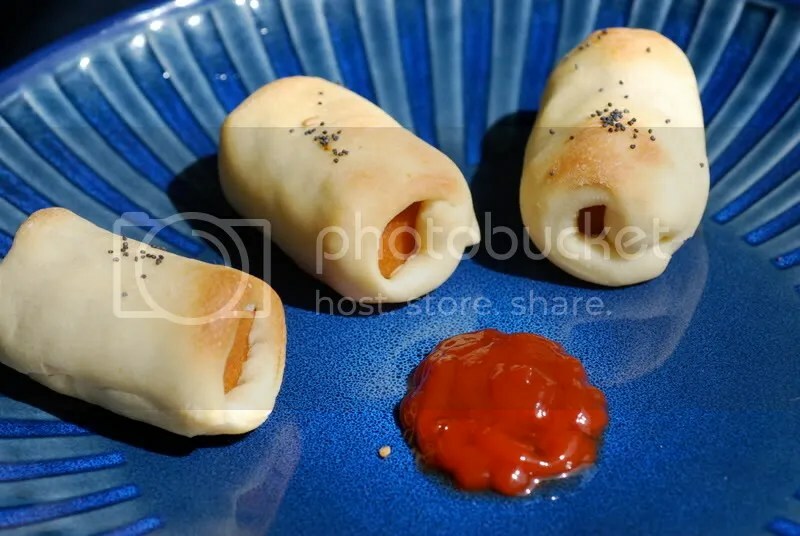 Could you call your Pigs in a blanket creation, “Figs in a blanket?” since it’s meatless and it rhymes? football IS personal, Gail…we’re in America. That said, I have to admit, I only turned on the game for the last 20 minutes. I would rather have been baking these! Romina – I couldn’t agree you with more! Emily – Consider it done! I’ll make a post this weekend – thanks for the inspiration! Erin – I know, I know …. and you couldn’t have chosen the worst time for a New Englander to tune into the game! MrsPresley – Thank you for coming by! I am looking forward to our first DB challenge!